The Gay Gamer: What's on your holiday wish list? With Thanksgiving in the rear-view mirror, it's time to look forward to all of the gift-giving and gift-receiving holidays that dot the December page on the calendar like so many pieces of candy on a gingerbread house. Speaking of gifts, what gaming-related ones are you hoping to receive from the fat man in the red suit (or whoever presides over your winter holiday of choice) this season? Surprisingly, my wish list contains just one item at the moment: A 3DS. A red 3DS like the one above, in particular. I know I've spent a lot of time whining here and on Twitter about wanting a pink one--and only a pink one--but it's now quite clear that the pink 3DS that's already available in Europe and Japan isn't going to be released in North America anytime soon and, frankly, my desire to obtain a 3DS, any 3DS, by the end of 2011 currently outweighs my desire to own a pink 3DS at some future point in time. Anyway, the point of this post wasn't to share my holiday wish list; it was to ask about all of yours. So, have at it! You're buying Robb a 3DS? Or you may be buying him one? I bow down to you, Justin! He must really like yours, eh? As for wanting the new Kirby games (for DS/Wii): Yes! I should have added them to my post but, like you, I couldn't remember them at the time. And of course I also want the new Layton. Sigh. 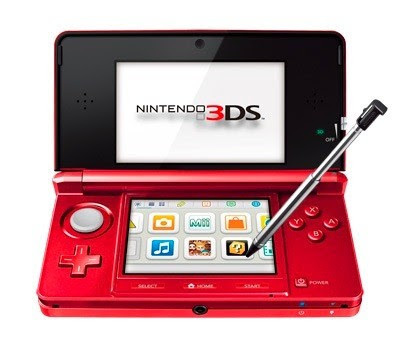 3DS systems and bundles get a $40 gift card + Bobble Head Stylus with purchase. Are you kidding me, Darwin?!? Oh, man, I don't think you are, based on that link. Welp, I guess I'll have to let my parents know about this tomorrow. I have a feeling they've already bought me a red one (basic, not a bundle), but it shouldn't be too difficult for them to return it and get this instead, should it? Oh, I'd love to snag a copy of Radiant Historia for the DS. I hear it's great. Have you played it? I really want a 3DS as well. The only problem is I want an american 3DS. I know there'll be a few atlus games or XSeed games on the system that will never make it to europe and the region locking on the machine is a terrible decision on nintendos part. Most of my DS games come from America. Hopefully I can pick up a US one soon... and when I've the money! Thanks, Anne! I hope I get it, too! Although, honestly, I'd be perfectly happy with the red one. I feel like I have to bring up the pink one, though, since it's actually a better deal -- a free game PLUS a $40 gift card? Crazy! Finally, I've heard great things about Radiant Historia, but I've never considered getting it, for some strange reason. I seem to remember it being on sale on Amazon recently, BTW -- you may want to keep an eye on that so you can snag a deal! Retr0gamer: Ah, I feel your pain. Really, it's terrible that Nintendo decided to region-lock the 3DS. If they hadn't, you wouldn't even have to worry about where you bought your 3DS; all you'd have to worry about is importing any titles that aren't released in your territory. Sigh. Anyway, I hope you get a 3DS -- someway, somehow -- soon!